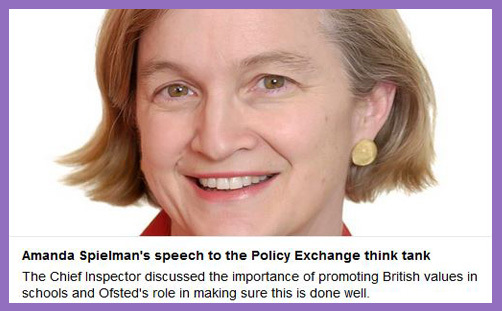 Ofsted Chief Inspector Amanda Spielman gave a speech yesterday evening entitled ‘The Ties that Bind‘, which concerned the need for a little more ‘muscular liberalism’ in education. She spoke at the think-tank Policy Exchange, and gave a spirited defence of how Ofsted approaches the sometimes thorny issue of the role of religion – especially confessional religion – in education, and of the need to assert (or, rather, inculcate) a better understanding of fundamental British values (democracy, the rule of law, individual liberty, and mutual respect for and tolerance of those with different faiths and beliefs). It is regrettable that we at Ofsted are experiencing increasing hostility from a few schools to law and policy that do not fit well with the preferences of the most conservative religious groups, and to the parts of government that inspect and regulate. Some groups are quick to allege bias or antagonism on the part of inspectors, and sometimes simply to misrepresent the inspection process. The fact that we have found significant shortcomings in a relatively high proportion of schools in the independent sector is alleged to be evidence of a bias against religion, even though no such difference is identifiable in outcomes for schools in the state sector. Our inspectors find and report on truth as they see it, in line with the law. Of course, ‘truth as they see it’ is dependent on a particular apprehension of the law and its application in specific contexts (do Ofsted inspectors, for example, really need to quiz 10-year-olds about ‘exotic’ matters of sexuality? How can a Christian school be ‘excellent’ one year and ‘failing’ the next, when they are doing nothing differently?) Are ‘conservative religious groups’ a particular victim of insensitive and occasionally intolerant inspectors? Ofsted is “not biased against faith schools”, Amanda Spielman insists; nor do they have a “secular agenda”. And yet she expresses concerns about “an expanding sense of religious and/or cultural entitlement to have aspects of a school’s provision dictated by the preferences of a particular group”, which would appear to be an expression of preference toward secularity under the mistaken guise that such an ethos is ‘neutral‘. Parliament sets the framework of law, but occasionally it does appear as though Ofsted’s operation within that framework is a little narrow in its understanding of religious liberty – the case of the Yesodey Hatorah Senior Girls’ School in Stamford Hill being a case in point. But whatever your view of ‘muscular liberalism’ or ‘openness and tolerance’ or the limits of ‘equalities’ and ‘protected characteristics’, there is a single sentence in Spielman’s speech which perhaps provides a clue of the real source of the ‘clash of worldviews’ between educational secularity and religious orthodoxy: “For example, the persecution of Catholics in England in the 16th century highlights the suffering that can follow from the absence of religious freedom,” HM Chief Inspector holds up as an illustration of the human cost of religious prejudice and intolerance. There is no nuanced apprehension of the murky history here; just a stark assertion of religious illiteracy. Presumably Protestants are the ‘conservative religious group’ in this context, and were bad for denying religious freedom to the good and humble Catholics for no reason other than religious bigotry and intolerance. There’s no grasp of the quest for English national identity as a bulwark against political interference by papal powers; no apprehension of the outrageous exploitation of people’s natural affections and spiritual fears with such practices as indulgences and teachings about purgatory; no understanding of the yearning for salvation, of individual justification, of being made right with God without paying sweeteners to a church mired in corruption and clericalism. Funny, isn’t it, how Spielman’s apprehension of history and religion doesn’t quite stretch to the persecution of Protestants in England (and, indeed, throughout Europe) in the 16th century, who suffered “the absence of religious freedom” somewhat before they felt the need to reciprocate on the ascendant. Where was John Frith‘s religious freedom when his mind was illuminated against the errors of Purgatory and Transubstantiation? Where was the Catholic ‘tolerance’ of other Lollards who were tortured and burned alive just for believing there was no need for popes, priests, or an institutional church? Their only crime was that they believed each and every individual could make peace with God, and for that the detested ecclesiastical hierarchy put them to death. Yes, Ms Spielman, the persecution of Catholics in England in the 16th century does indeed highlight the suffering that can follow from the absence of religious freedom, but such intolerance did not come out of the blue: bigotry feeds bigotry, prejudice compounds prejudice, dogmatism magnifies dogmatism, and hate breeds hate. Don’t therefore be surprised if Ofsted’s intolerance of some ‘conservative’ expressions of religion are met with intolerance of Ofsted by the religiously conservative. Tolerance fosters tolerance; latitudinarianism cultivates generosity and grace.